Write your own personal best record on your personalized medal display. Perfect for runners, triathletes and any other sports! Are you ready for your new Personal Best this year? Motivate yourself with this awesome chalk paint finish medals holder. Write your own Personal best as you go.... Erase and re-write once you did better! Perfect to showcase all your achievement in style! This HUGE medal display is actually 31 inches long by 10 inches tall. It comes in a slate black only. Each hook is 1 1/4 inch long and can hold many medals. All hardware are included but not installed. It will take you only a few minutes to screw in the hooks by hand. Specialize yours with either running, triathlon or blank for any other sports distance on the right. 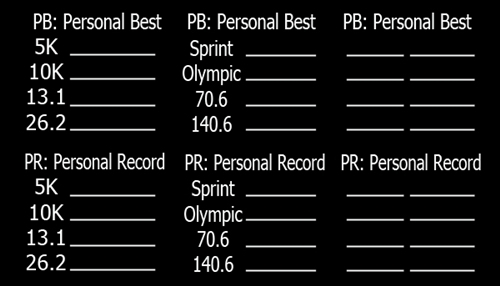 Decide if you prefer the old slogan: "PR: Personal Record" or the newest more trendy one: "PB: Personal Best". Choose if you prefer to have race bibs or picture frame on the left side. 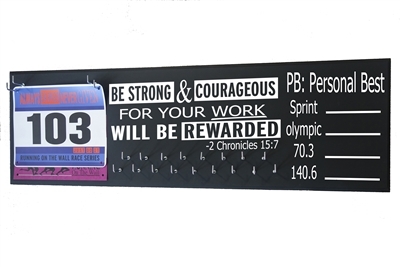 More than 100 race bibs of all sizes can be displayed with our double hooks and rings system. Picture frame option will allow you to insert your own 5 x 7 picture. We also offer 2 different finish. The traditional and more modern option with fully painted edges or the more worn out distress finish. On the second option we simply sand out some paint on the edges of the board to give it more of a distressed character that fits well with country style. Chose from our tons of ready quote on Personal best chalk board medal holder here.